HALIFAX (6 June 2006) – CANADA will join aggressive U.S.-led military manoeuvres in the Caribbean between May 23 and June 15, news agencies are reporting. Canadian forces will be part of manoeuvres ominously dubbed Joint Caribbean Lion in Curaçao and the French island of Guadeloupe. The massive war games, the largest in over twenty years, includes the participation of forces from the North Atlantic Treaty Organization (NATO) and countries in the hemisphere (Chile, for instance, sent observers), except for Cuba and Venezuela, which could be the targets of that show of force, according to news agencies. 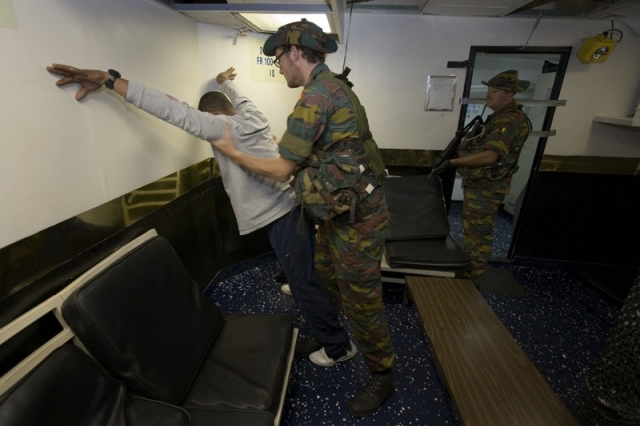 Although Holland claims to be the training leader, regional social and political groups and governments have called attention to the exceptionally strong US military presence, and attribute threatening objectives to it. After ordering departure of three military ships from Norfolk, Virginia, the US Southern Command reported that actions will be conducted by Amphibious Squadron Commodore Donna Looney of the Second Amphibious Squadron 2 on board the multi-functional landing ship USS Bataan. 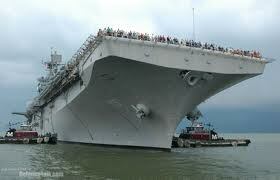 Bataan is one of 24 ships that comprise Commander, Amphibious Group 2, based at NAB Little Creek, Va. 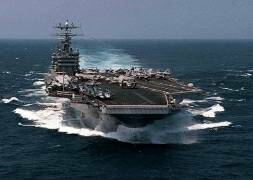 The nuclear aircraft carrier USS George Washington is leading the sea/air forces in the manoeuvres already taking place, dubbed “Operation Partnership of the Americas,” and the strike group includes the guided-missile destroyer Stout, the guided-missile frigate Underwood, the amphibious landing ship USS Fort McHenry and the frigate USS Taylor with about 6,500 sailors and – if necessary – two nuclear submarines. The fictitious objective is to “foster goodwill” in military relations between the U.S. Navy and countries in the region, and to intensify efforts in the fake fight against drug-trafficking and terrorism. For the Netherlands, this is an exercise of the utmost importance; its three branches are conducting an unprecedented exercise of this magnitude never before carried out in cooperation with other NATO countries. It is the largest naval exercise the Netherlands with its NATO allies in the Caribbean has ever held, using a U.S. aircraft carrier and naval fleet. The scenario of the maneouvres include an amphibious landing operation on the island of Curaçao. For Venezuela, which is represented by observers in the exercises, the maneouvres look like a provocation. They concern the establishment of permanent U.S. military bases in the Netherlands Antilles islands of Aruba, Bonaire and Curaçao, which lie only 40 kilometres from the Venezuelan coast. With air reconnaissance flights, depth measurements and land analysis, the United States could be evaluating its possibilities of success for an invasion against a country in the area, regional analysts say. The scenario of a separate simulated exercise, reminiscent of the failed coup d’état in Venezuela in 2002, involves “Samba” President “Leo Flexible,” who is to be held hostage by the militia at one of the old apartments of Mullet Bay Resort. The marines are unable to rescue or take over the hostage, because the militia moves him to “Arie Galore.” Special Forces teams of the Maritime Taskforce are sent to that island to set him free or, reading between the lines, take him into U.S. custody. The London Observer reported “the failed coup (of 2002) was closely tied to senior officials in the US government” with “long histories in the “dirty wars’’ of the 1980s, and links to death squads working in Central America at that time.” The Bush administration has made a number of hostile remarks in the past and taken measures which many fear could precede to future interventions. In April, US Secretary of State Condoleezza Rice called for an “international united front” against Chávez. Venezuelan president Hugo Chavez has called the Dutch Defense Minister a “Washington stooge” for allowing U.S. navy vessels to be deployed to the Antilles. Speaking in Alo Presidente, the weekly television program he uses to addresses the nation, Chavez suggested the U.S. may want to use the Antilles Islands to invade Venezuela. Chavez has dismissed the suggestion by right-wing Dutch hawks that his country has territorial ambitions on the Antilles. The Dutch have said they are satisfied with this response, according to AP. Once the centre of the Caribbean slave trade, the island of Curaçao was hard hit by the abolition of slavery in 1863. Its prosperity (and that of neighbouring Aruba) was restored in the early 20th century with the construction of oil refineries to service the newly-discovered Venezuelan oil fields. The island of Saint Martin is shared with France; its southern portion is named Saint Maarten and is part of the Netherlands Antilles; its northern portion is called Saint-Martin and is part of Guadeloupe (France). The Canadian government is keeping its military participation in Joint Caribbean Lion quiet. The Canadian government is keeping its military participation in Joint Caribbean Lion quiet. There is no mention of its involvement on the Department of National Defence website, although Canada’s participation is extensively reported in the Latin American and Caribbean press, as well as U.S. Navy website. This is in line with the fiction that Canada is free of any imperialist or neo-colonial interests in that region. Canadian banks are amongst the most powerful and profitable operations in the Caribbean. Their penetration of the region arose historically from the involvement of the rich strata in the Nova Scotia colony in provisioning the West Indies slave trade as the basis for accumulation of capital. Both the Bank of Nova Scotia and the Royal Bank of Canada (RBC) were founded in Halifax, NS. Historically, the first intrusion of Canadian naval forces in the Caribbean, under the command of the British Royal Navy, was as part of the gunboat policy against the Mexican Revolution in 1915, a role repeated in 1932 when a Canadian warship was deployed against the uprising of the landless peasants of El Salvador. The Canadian navy successively participated in the illegal maritime “quarantine” of Cuba in October, 1962 under direct orders from the U.S. Navy and without reference to or the approval of the Diefenbaker cabinet, which had incensed the Kennedy administration with its “failure to obey” the CIA-organized Bay of Pigs invasion in April, 1961; the invasion of the Dominican Republic in 1964; the gunboat policy against Trinidad and Tobago in 1970; the massive Exercise Ocean Venture in 1982, which rehearsed the U.S. invasion of Grenada in 1983; the gunboat policy against Nicaragua in the mid-1980s; and U.S. interventions in Haiti in the mid-1990s and the invasion and occupation of Haiti in 2004 by the U.S., France and Canada. During the 1980s the anti-war movement in Halifax, under the banner of No Harbour for War, held annual protests against the deployment of Canadian warships to participate in Caribops military exercises on Vieques Island, Puerto Rico. Caribops 83 involved 11 Canadian destroyers and 2,500 troops, and was condemned as part of the offensive of the Reagan administration against the just struggles os the peoples of Central America. In August, 2005 Canadian Forces participated in annual US exercises aimed at remilitarizing the Panama Canal zone code-named Panamax 2005. The exercises were initiated in 2003, a year after the unsuccessful coup attempt in Venezuela. 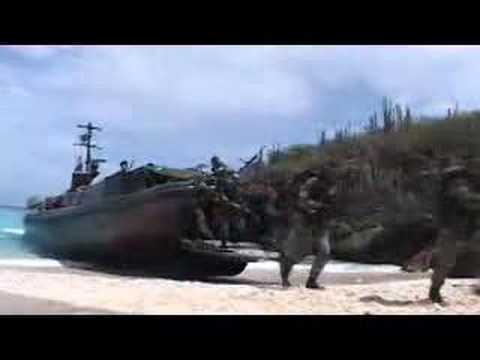 (June 5, 2006) – VENEZUELA recently conducted a simulation of a foreign military invasion called Operation Patriot 2006. It was part of a military exercise to train troops and communities to repel a foreign invader. The Venezuelan government said it is preparing citizens to fight a guerrilla war to repel a possible Iraq-style invasion by U.S. troops. During the exercise, a naval landing craft made landfall on the shores of Western Falcon state carrying troops and over a dozen camouflaged tanks, Reuters reported. The “invading” army then took over the massive Paraguana Refining Complex, a key asset of Venezuela’s crude exporter. “The tanks began circulating through the streets, and units of mock invading soldiers launched smoke bombs to clear the way. But local residents, organized and trained by military authorities, resisted the assault by blocking roads with rusting cars and burning tires,” Reuters reported. Community organizations called Local Defence Councils have been established to provide support during a potential invasion by hiding weapons deposits, relaying messages or sabotaging water and power services. “We’re willing to go anywhere to defend our homeland,” Rosmery Trujillo, a participant in the operation, said. Quintana said the mock attack involved nine warships, three combat planes and four helicopters. The exercise included Venezuelans trained to defend the nation’s strategic assets including oil terminals, fuel filling stations and tanker trucks. (May 15, 2006) – THE government of the United States climbs to new heights of cynicism and shamelessness when it tries to tie Venezuela to its particular vision of international terrorism. It affirms that Venezuela is not “collaborating sufficiently” with the fight against terrorism. If “not collaborating” means not supporting the virtual genocide that it practices against the people of Iraq and failing to condemn it with all might before all the possible forums, then under no concept or pretext can it be said that Venezuela is not willing to “collaborate.” If “not collaborating” means condemning the pretense of imposing upon the people of Iran the need to resign from its legitimate right to develop nuclear technology for peaceful ends, under the extreme threat of military attacks against it, Venezuela is proud to respond that it shall never lend itself to demands of such nature, no matter what pressures are brought to bear against it. Public opinion knows the emphasis that the present Administration, with President Bush at the helm places on the principle that “a terrorist is not only he who engages in acts of terrorism, but also those who harbor them.” This principle permits us to affirm without fear of being mistaken that current U.S. authorities are terrorists. By the same token, public opinion is well aware of the shelter that the U.S. is providing the most criminal of terrorists in the Western Hemisphere, Luis Posada Carriles, a well known assassin on the payroll of the CIA. Public opinion also knows of the order given by U.S. authorities to release two persons accused of terrorism by Venezuelan courts of justice: Antonio Colina and Germán Varela, who placed bombs in the diplomatic missions of Spain and Colombia, allied countries of the United States of America. The Bush Administration has simply not responded to the request made by Venezuela for their extradition, under treaties and international law, to answer for their crimes. Instead, the U.S. shields behind miserable accusations such as the danger that these criminals will be tortured. What are they trying to hide behind these accusations against Venezuela? The essence of the problem is not its false fight against terrorism. Behind its despicable accusations is a useless campaign of shame designed to isolate Venezuela, destabilize its democratic government and prepare the political conditions for an attack. To that end, along with other actions, it wants to handicap our defenses. That is the reason why it prohibits the sale of arms and corresponding services. That is the reason why it brings pressure to bear to prevent it from acquiring the means to defend itself, including simple border vigilance, or what has happened with the negotiations to acquire aircraft from Spain and Brazil. That is the reason behind the accusations that Venezuela has launched an arms race. There is too much clarity to obscure it with accusations and shameless acts. They have tried to separate Venezuela from its other friendly nations on the continent and the world. They have failed and will continue to do so. The Bolivarian Republic of Venezuela denounces to the world this new stage in the U.S. strategy of defeating our democratic government in order to impose, as it has done so many times on the continent and in the world, an obedient dictatorship. We ratify that Venezuela will not succumb to any kind of pressure. It will firmly resist the attacks of this nature and counsels not to confuse the cowardly and opportunistic expressions of some, with the will of the people. This is an error that they have committed recently with other people that pay dearly with their dignity, but who also must pay with the price of aggression. Our country extends its hand of friendship to the people of the U.S., but it does not hesitate to close its fist to respond to an aggression, may it be verbal as well as material, as undertaken by an immoral government with an aggressive nature. Our people have confidence in the wisdom of the people of the U.S. and we are confident that they will know to impose their will before those who not only assassinate the people of other countries, but also those who sacrifice their own children for their worthless cause. (May 18, 2006) – FOLLOWING the announcement by the State Department that it was imposing an arms sale sanction against Venezuela, a Chávez advisor infuriated Washington when he responded with an apparently retaliatory announcement that Caracas would consider selling its American-made F-16’s to Iran. The proposed sale irritated U.S. policymakers, whose initial imposition of the embargo was rationalized by the vague, if not totally contrived, accusations involving Hugo Chávez’s friendship with the leaders of U.S. classified rogue states of Cuba and Iran. Caracas’ threat of selling off the F-16 is somewhat logical, as the U.S. earlier had denied Venezuela the parts necessary to maintain its fleet of 21 F-16’s, rendering those aircraft – which are in need of upgrading and repair – little better than scrap metal. In a certain sense, Washington’s new round of bluster can be properly seen as merely part of an ongoing war of words and spleen against Caracas, in which Chávez more than holds his own, much to the joy of the average Latin American. Venezuela and the U.S. have exchanged countless salvos of sharp rhetoric at each other, with Chávez describing the U.S. as a “pig” whose appointment at the slaughterhouse is imminent, and Secretary of State Rice portraying the Chávez administration as unconstructive and as being “a negative force in the region.” Venezuela’s gonzo response to the new U.S. embargo fits into the milieu of bounteous hot air that has become increasingly typical between the two countries, though it has not yet ended up with the CIA ultimately being called in to settle matters. There is some reason to believe, however, that the State Department actually does have a plan, and that these verbal jabs on Washington’s part have a calculated purpose, as they seem to represent a concerted attempt to undermine the legitimacy of Chávez’s constitutional government. This effort already has included backing a failed coup against him in April 2002 – which has resulted in unremitting hostility ever since. It is also worth commenting that Chávez’s own reaction has been only slightly less confrontational. The big difference is that Chavez is being the playful, irascible, confounding and confrontational wunderkind that he always has been. As for the State Department, with Secretary Condoleezza Rice as its author, its Venezuela policy continues to be bovine, hypocritically cynical and grossly unprofessional in promoting a heavy handed policy against Venezuela, as much based on inventions and gross exaggeration as on facts. This strategy, after it condemns all other peaceful options and decides to turn to a CIA deployment or negotiates an agreement with a contract killer to eliminate Chávez in order to safeguard the U.S.’ oil supply from the regime, would cost Washington dearly. One can only hope that somewhere in the Bush administration, a concentration of fast disappearing wisdom remains, and that it can bring to a halt the State Department’s precarious – if not suicidal – descent into reckless arrogance and sprawling self-indulgence. As of now, the administration’s game plan is primitively simple and grossly offensive. Inspired by Nazi-era propaganda czar, Joseph Goebbels, the model is to keep on relentlessly denouncing Chávez as a “dictator” until the public begins to automatically accept the connections between the word and the man. Of course, standing in the way of the administration’s success in convincingly making its case is the fact that Chávez’s political movement has won twice the number of highly attended elections than President Bush has, and by consistently far larger majorities – around 60 per cent better. Furthermore, the TV networks are overwhelmingly dominated by the Chávez-hating middle-class opposition, and the same is true for the print media. To describe today’s Venezuela as a dictatorship is an unmitigated lie, and despite the adamant pleas of Rice and Defense Secretary Rumsfeld, it is subscribed to only by a questionable sector of the U.S. media, led by Washington Post columnist Jackson Diehl and the extraordinary science fiction editorial page of the Wall Street Journal.